Meet Joe Ibraham, a senior journalism major with minors in marketing and graphic design from Massapequa, New York. Find out how a course at Hofstra allowed him to be the art director of a magazine! I first walked into my magazine production class last semester thinking it would be just like all the other courses I’ve taken. I was wrong. The magazine production course at Hofstra is not like the rest. You don’t sit there for an hour and a half listening to a professor and you don’t scramble to write down all the notes before they wipe the board clean. 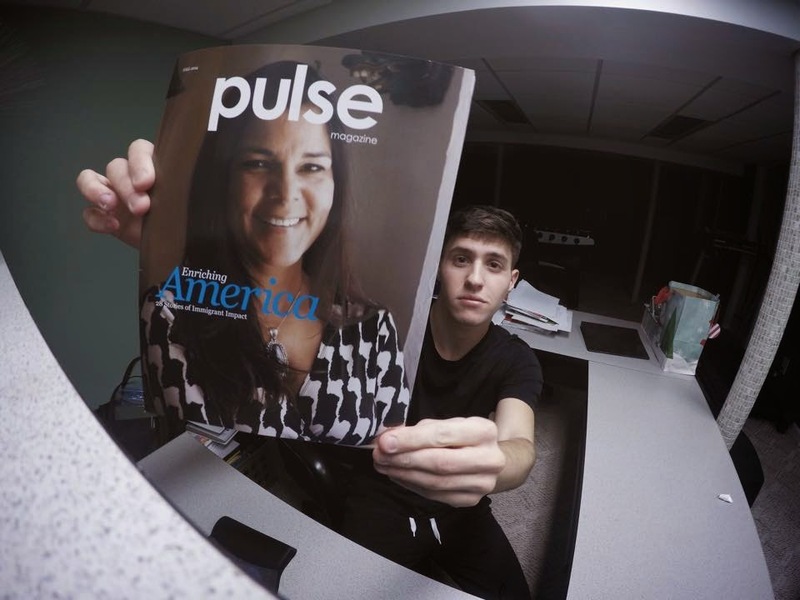 Instead, you work side by side the other students, as a team, to produce Hofstra’s official magazine, Pulse, from top to bottom. That means you sell ad space, find a printer, generate story ideas, and design the entire forty-page issue. During my time in the course last fall, I was chosen to be the Art Director of the issue. My professor, Daniel Van Benthuysen, warned me that it would be a lot of work, so I was aware of what I was jumping into if I chose to accept. I remember him saying that as a team, we were “a funnel”, and that the Art Director sits at the bottom. Everything makes its way past the Art Director, who holds the most important position. The next day, I came back to him saying I would do it. For three months, my class and I worked on the issue. We even shared the responsibility of reaching out to potential clients to sell ad space. Some clients requested that we create an ad for them. That’s where I came in. Eventually, after months of teamwork, we had the magazine framed out. Every pixel and every letter was meticulously placed and settled. After dropping off the files to the print broker (the middle man between us and the main printing facility,) I was invited down to the print shop to see the magazine being processed on a $3 million machine. It was incredible to see something I had been working on for an entire semester come to life. It was an incredibly draining experience, but it was so worth it. I would most definitely recommend the class to anyone looking to be a part of something rewarding.